Materials: Beech wood with inlaid minerals. Rim is translucent calcite. Finished with aniline dyes and tung oil. Featured on the cover of Art Calendar magazine. In the Collection of OneWay Manufacturing (Canada). Comment: This is the first inlaid platter I made. The cherry trees were in full bloom all around the Seattle area and I felt inspired to try something different. 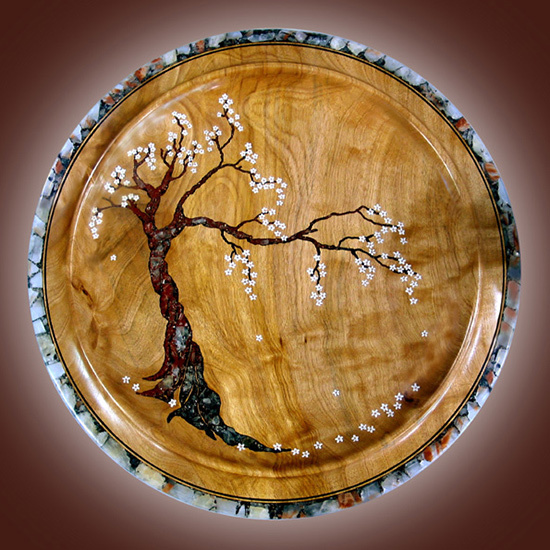 I have since made dozens of platters featuring trees in bloom but every one is unique and enjoyable to make.